The 2015-2017 Wisconsin State biennial budget reduced University of Wisconsin System funding by $250 million. Cooperative Extension’s portion of the cut is $3.6 million per year—8.3% of its ongoing state funding. The most recent state cuts went into effect on July 1, 2015. Though state funding cuts prompted this project, the nEXT Generation project is not simply about reducing budgets. It’s a chance to modernize UW-Extension and ultimately make it stronger. UW-Extension will embark on changes in both organizational structure and delivery of educational priorities that will best serve our current and future audiences. The project also needs to support the division’s purpose, which is to teach, learn, lead and serve, connecting people with the University of Wisconsin, and engaging with them to transform lives and communities. On February 10, 2016, Chancellor Cathy Sandeen released the final directions for the nEXT Generation project reorganization in a news release. The chancellor charged the three executive sponsors with leading the process and building a project team to manage the process and timeline. Be transparent and humane in the decision making process. Communicate the hows and whys as decisions are made as soon as possible. Remain true to our mission and provide the highest level of services to the Cooperative Extension’s students, learners, clients, listeners and viewers. Be responsible in implementing cuts and planning for the future. Priorities for nEXT Generation draw on recommendations developed during fall 2015 and on extensive feedback from Wisconsin county leaders, Cooperative Extension and UW System colleagues, agriculture groups and other stakeholders. Structuring county and area jobs to let educators and researchers focus on education and research rather than administrative tasks. Keeping a Cooperative Extension office in every county while establishing multi-county areas that consolidate administration. Staffing each area to reflect the specific circumstances and needs of its component counties, recognizing that there’s no one-size-fits-all approach. Respecting different levels of county investment, ensuring that each county receives services proportionate to its funding. Maintaining single-county areas in counties with populations over 250,000, but connecting these counties to share ideas and resources. Developing a statewide network for Cooperative Extension offices in tribal nations. Prioritizing state specialist positions and reducing supply and equipment expenses to meet budget targets for campus-based programs. Gradually and collaboratively establish greater flexibility in appointments for state specialists—faculty experts typically affiliated with UW System campuses—to better address emerging needs. Integrating technology into program delivery, educational products and administration. Promoting opportunities to generate new revenue. Aligning administrative functions to best support products and services to tribal, county and campus partners. Consolidating administrative functions with UW-Extension administration where possible for greater efficiency and flexibility. President Ray Cross announced a plan on October 11, 2017 to restructure UW Colleges and UW-Extension. As part of this plan, the Cooperative Extension division of UW-Extension will become part of UW-Madison, effective July 1, 2018. The implementation of the nEXT Generation model will continue as we transition to UW-Madison. This announcement may mean some changes to the organizational design as we work towards these changes, however, the goals and priorities of the project will remain the same. Please email nextgencommunications@ces.uwex.edu if you have any questions. Work closely with counties to establish priorities and staffing needs, within the parameters of the budget reduction targets. Consolidate administration, where possible, to allow community researchers and educators to focus entirely on their areas and expertise, rather than on administrative tasks. Ensure financial proportionality between counties within a multi‐county area. For example, the services one county receives should be proportional to its investment. Based on feedback, take into consideration that investments vary from county to county. Design an appropriate governance structure in each multi‐county area. The map of multi-county areas is shown below. Locations of offices are and tribal communities are approximate, and the names of some tribal communities have been shortened for spacing, like the Fond du Lac Band of Lake Superior Chippewa in Douglas County which has been shortened to Fond du Lac. Each single- and multi-county area will be led by one full-time Area Extension Director (AED). The decision and high-level responsibilities of this position are listed in the March 3rd decision memo on regional administration found on the project website. These AEDs will be led and managed by one of two Assistant Deans, each of whom will lead a group of areas, which are split between the north and the south by the bold-blue line on the map. Northern areas will be led by Dave Berard and southern areas will be led by Matt Hanson, as indicated by the double asterisks. You can review the announcement on these Assistant Dean hires in the March 31 Internal memo. 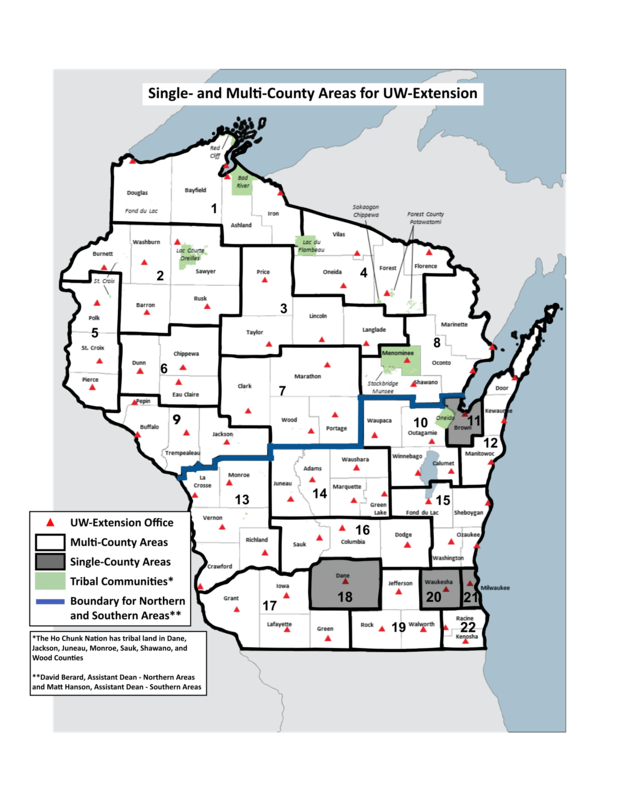 Please remember that Cooperative Extension made the decision to create single-county areas for high-population counties, which can be found in the February 10, 2016 Report. Single-county areas are shaded gray.